One week ago, University of St. Francis needed a game-tying three-pointer from Terrion Howard (5'4''-PG) at the end of regulation and an eventual overtime victory just to get into the 2019 Chicagoland Collegiate Athletic Conference Men's Basketball Tournament. On Saturday, the Saints (18-14) completed the unthinkable postseason trifecta with their third straight road win - all by five points or less - in five days. 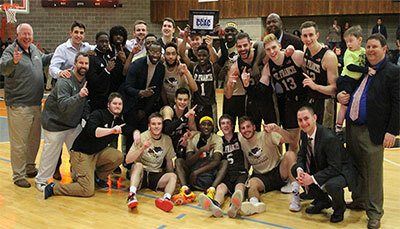 By defeating defending tournament champion Governors State University 59-54, the Saints landed the program its first conference tournament title in 23 years and a date at the NAIA Division II National Championships March 6-12 in Sioux Falls, South Dakota. To get there, head coach Ryan Marks' club had to knock off top seed and regular-season champion Olivet Nazarene University (81-80 on Tuesday), No. 4 seed Roosevelt University (68-63 on Thursday) and the No. 3-seeded Jaguars on Saturday. USF's last and only previous tourney crown came during the 1995-96 season, which also netted the Saints their second trip to the NAIA national tournament. This year's bid to the 32-team tournament will be the program's fifth overall and third in the last five years. Defense and Howard were again the storylines on this day as the Saints held Governors State to its fourth-lowest point total and its third-lowest shooting percentage (.290) in the four-year history of the Jaguar program (126 games). That defense, which also limited Governors State to just three treys in 15 attempts (.200), also snapped the hosts' perfect 5-0 mark in CCAC postseason play. Howard, meanwhile, led the Saints in scoring for the third time in four contests and the second time in the postseason with his 18 markers and perfect 6-for-6 accuracy at the foul line. In USF's current four-game winning streak, the senior guard has converted 22 of his 23 free throw attempts, including the one with five seconds left to defeat Olivet Nazarene on Tuesday. Reilly Goulet (6'4''-G) also played a crucial role off the bench with three key plays. His three-pointer just before halftime capped off a 12-4 run to send the Saints into the locker room facing just a one-point deficit (28-27) after falling behind by their largest margin, 24-15, at the 4:54 mark. Goulet also gave the Saints their biggest lead of the day (45-38 with 12:35 to play) with his second three-pointer of the game to close out an 8-0 burst. Mitchell Kwasigroch (6'5''-F) started the quick 43-second flurry with a three-pointer to put the Saints up for good and Malik Bailey (6'0''-G) sandwiched in a basket off a steal in between the two treys. For the half, the Saints were 5-of-11 from beyond the arc after going just 3-for-12 in the opening 20 minutes. Governors State (17-16) was able to get as close as one point three times the rest of the way, including twice in the closing 30 seconds. The Jaguars' best chance at breaking that deficit came after a thunderous dunk by David Anderson (6'7''-PF) (8 points, 11 rebounds) that sent the home crowd of 500-plus into a frenzy followed by a St. Francis missed free throw with 24 seconds left. But Shane Maple (6'1''-SG), who led all scorers with 21 points, missed on a short jumper with eight seconds to play. Enter Goulet again, who hauled down the rebound and then sank four free throws in as many attempts, along with two more by Howard, in the closing seven seconds to punch USF's ticket to the national finals. Goulet finished as the second-leading scorer (12 points) for the Saints behind Howard. Maple totaled eight rebounds to go along with his 21 points. Robbie Brooks was the only other Governors State player to score more than eight points. He finished with 15. St. Francis joins Olivet Nazarene in representing the Chicagoland Collegiate Athletic Conference at the 28th Annual NAIA Division II National Championships. Both teams will find out Wednesday their first-round foes when the NAIA releases the 32-team field and pairings. SG: Shane Maple (6'1''-SG) of Governors St.
PG: Storm Cook (6'0''-PG) of Holy Cross Coll. G: Robert Brooks (6'3''-G-97) of Governors St.
F: Bryce Crosen (6'6''-F) of Holy Cross Coll. PG: Jeremy Carlyle (5'9''-PG) of Trinity Intern. Robby Jimenez (6'4''-G) of Holy Cross Coll. Brandon Lawani (6'7''-F) of Trinity Intern.